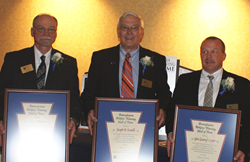 Three members were inducted into the Pennsylvania Athletic Training Hall of Fame in 2014. The Society also honored team physicians, licensed athletic trainers and college athletic training students. All award recipients received their awards at the annual Symposium Banquet, during the PATS Annual Convention in Gettysburg, Pa. The Pennsylvania Athletic Trainers Society, Inc (PATS) held its annual symposium in Gettysburg, Pa at the Wyndham Hotel. 299 licensed athletic trainers and 53 college athletic training students attended the three day event. A wide variety of continuing education classes were offered for licensed athletic trainers which allows them to maintain their license to practice in the Commonwealth of Pennsylvania. The PATS distributes five scholarships to deserving athletic training students who attend Pennsylvania Athletic Training Education Programs. The Richard Burkholder Scholarship was awarded to Steven Davi, a recent graduate of Kings College. The Phillip B. Donley Scholarship was awarded to Allision Gardiner of Kings College. The NATA District 2 – Joe Iezzi Scholarship was presented to Morgan Langon of Duquesne University. The PATS, Inc Scholarship was awarded to Nathaniel Nester a recent graduate from Messiah College. The inaugural Cecilia Yost Scholarship was awarded to Angelica Nunez who attends California University of PA.
Also this evening, PATS presented awards to deserving licensed athletic trainers. “It is an honor to facilitate the PATS Annual Awards Banquet. These individuals are so deserving of the recognition that they receive during this evening” stated Yvette Ingram, PATS President. The 2014 PATS Service Award was presented to two athletic trainers. The first was awarded to Lindsey McGuire. Lindsey is a recent doctoral graduate of Temple University and will start working at California University of PA in the fall. She is the first and current co-chair of the PATS Technology Committee. The second Service Award was awarded to Tanya Miller. She is the current Chairperson of the PATS Governmental Affairs Committee and is the Assistant Director of Sports Medicine at Shippensburg University. She has worked tirelessly on educating state leaders on concussion, sudden cardiac arrest and other athletic trainer legislative issues. The PATS Team Physician Honorary Membership Award is awarded to a doctor who is a team physician and friend to athletic trainers. This year’s recipient is Craig Stabler MD who practices in the Williamsport PA area and is the team physician for Montoursville High School in Montoursville, PA.
PATS awarded three Distinguished Merit Awards to certified athletic trainers. Robert Blanc, the head athletic trainer for University of Pittsburgh was the first recipient. The second Distinguished Merit Award was presented to Edwin “Sandy” Bush, Jr. Sandy is the head athletic trainer at Messiah College. Finally, Thomas West of California University of PA was the final recipient of the Distinguished Merit Award. He is the program director for the undergraduate athletic training education program at California University of PA.
A few athletic trainers who received National Athletic Trainer Association (NATA) awards were recognized at the awards banquet. Larry Cooper, Gary Hanna, Greg Janik, George Roberts, and Mark Cherwony were honored as NATA Athletic Training Service Award winners. Dr. Paula Sammarone Turocy, a current PATS Hall of Famer was inducted into the NATA Hall of Fame this year. The NATA’s Most Distinguished Athletic Trainer Award was presented to Linda Mazzoli, PATS Executive Director. The first ever NATA Bill Griffin Legislative Award winner was George Roberts. The Central PA Chapter of the National Football Foundation Athletic Trainer of the Year Award was Scott Devore. He works at Bald Eagle Area High School in Wingate PA. The highlight of the night was the athletic trainers who were inducted into the PATS Hall of Fame. Three deserving athletic trainers were presented the honor. Gary Hanna of Edinboro University was the first inductee. He is a Past President of PATS and has served on various committees both statewide and nationally. He is currently the head athletic trainer at Edinboro University. He has worked with Olympic athletes at the Olympic Training Center in Colorado and was an athletic trainer for Team USA in the 1988 South Korea Olympics. The second inductee into the Hall of Fame is Glen “Larry” Cooper. He currently serves as the head athletic trainer at Penn Trafford High School in Harrision City, PA. He has been on the PATS executive board as Parliamentarian, and Southwest Representative. He is past chairman of several PATS committees and is the current chairman of the NATA Secondary School Committee. He has presented many times at the NATA, PATS symposia and received many awards from both organizations. For more information regarding this topic or to schedule an interview with PATS President John Moyer, LAT, ATC, please contact Linda Mazzoli MS, LAT, ATC, PATS Executive Director at patsexecutivedirector@gopats.org. The Pennsylvania Athletic Trainers' Society, Inc. is a progressive organization of licensed health care professionals who work under the direction of a licensed physician. Our society continues to increase public awareness and education regarding Athletic Trainers and the Athletic Training profession while serving as the premier source of information for public safety, injury and illness prevention, early intervention, patient care, and healthcare delivery for the physically active in the Commonwealth.